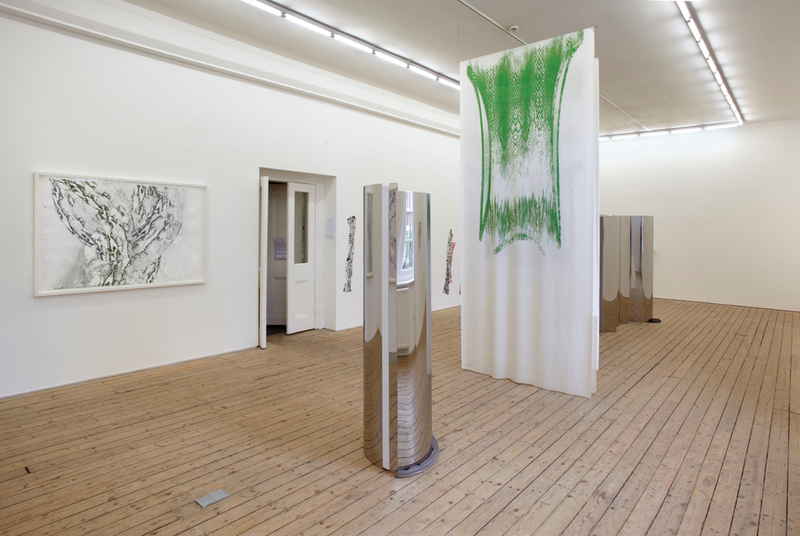 Installation view of Alice Channer's exhibition at The Approach. Photo: Courtesy The Approach. LONDON.- In Body Conscious, Alice Channers second solo show at The Approach, the focus of her work has moved away from the body of the room, to the human bodies it is in the room with. The body itself is never represented, instead, a conscious human body is everywhere that the work is not. The body that the works bring about is neither solid and central, or immediate and primal. Instead, it is mediated and extended by technology and commodified. Both of these factors explode and expand it, as well as contracting and concentrating it. The works consider the way in which the artists sensory apparatus - her tools as an artist - are mediated by consumption and technology. The large-scale hanging fabric work, Tight Skin uses a digital printing process to create stretched images of clothing prints taken from the bodies of amphibians. The works were made using a stretch snake print Primark vest and a stretch lizard print Maxi-Skirt. These pieces of clothing were then photocopied, scanned, stretched, digitally manipulated and digitally printed onto soft, vulnerable, glamorous Satin. The digitally printed fabric in these works looks to the way in which fashion designers have recently used this technique to bring technology very close to the body. The drawings Deep Skin and Skin Second are hybrid works, combining different speeds and techniques. They also make awkward use of technological processes. The drawings were made by photocopying, section by section, a velour snake print trouser leg. The leg was then reconstituted from the individual photocopies. This reassembled leg was then scanned, stretched and enlarged. Finally, the digitally manipulated leg was re-printed and then traced painstakingly by hand through a hand-marbled paper. The snake print is slow and deliberately drawn, and the marbling in contrast is very fast, a freeze frame of the movement of ink on the surface of water. Both speeds stutter, in the way in which the trouser pattern is cut up, and the marbled print is awkward and broken. For the artist, these drawings are a negotiation, via a commodity (the trousers) between her human body and virtual, digital space. All the works in Body Conscious entail a similar negotiation between the artists human body and the technological and industrial processes used to produce them. The width of Tight Skin, for example, is determined both by the limitations of the digital printer used to print them, the measurements of the fabric, and the dimensions of human clothing. The height of Slip is decided both by the length of the rollers used to curve the steel, and the height of the artists standing body. Made from stainless steel, in some ways these works curve like fabric, but they also retain the solid quality of metal, curving and reflecting in unexpected ways. Long coloured lengths of elastic stretch around the metal surface as if dressing the body of the sculpture. As with all Channers works the sense of place around the works and the way your own body navigates them is as important as the space the works occupy. Alice Channer lives and works in London. She has a forthcoming solo exhibition, Other-Directed at Bolte Lang, Zurich, and forthcoming group exhibitions at Lisa Cooley, New York, The Hole, London and Hilary Crisp, London. Recent Solo Exhibitions include Inhale, Exhale, Charles Rennie Mackintosh Gallery, Glasgow School of Art, as part of the Glasgow International, Scotland (2010), Worn-work, The Approach, London, (2009). Recent Group Exhibitions: Unto This Last, Raven Row, London, UK (2010), Everynight, I Go To Sleep, Stuart Shave/Moden Art, London UK (2010), Alice Channer, Dagmar Heppner, Alicja Kwade, Maria Zahle, Bolte Lang, Zurich, Switzerland (2010), Boule to Braid, Lisson gallery, Curated by Richard Wentworth (2009), The Quiet Revolution, Curated by Chris Fite-Wassilak, Hayward Gallery Touring Show (2009), Strange Solution, Curated by Katharine Stout, Art Now, Tate Britain, London (2008), M25 Around London, Curated by Barry Schwabsky, CCA Andrax, Mallorca (2008), Dogtooth & Tessellate, Curated by Michelle Cotton and Emma Robertson (2008). A Century of Archaeological Excavations Commemorated in "Teotihuacan, City of the Gods"